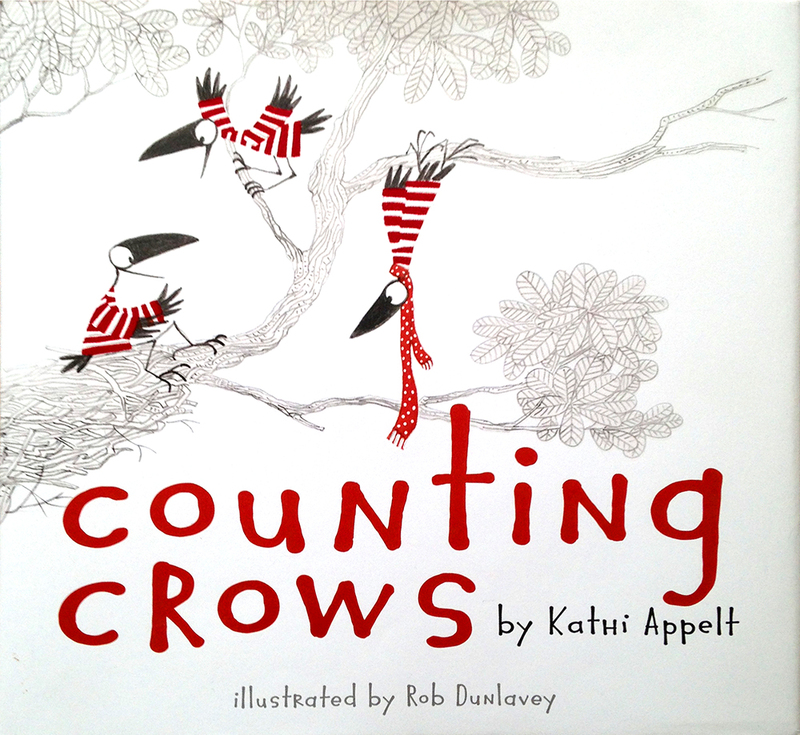 "A lively and original addition to the overstuffed genre of counting picture books. 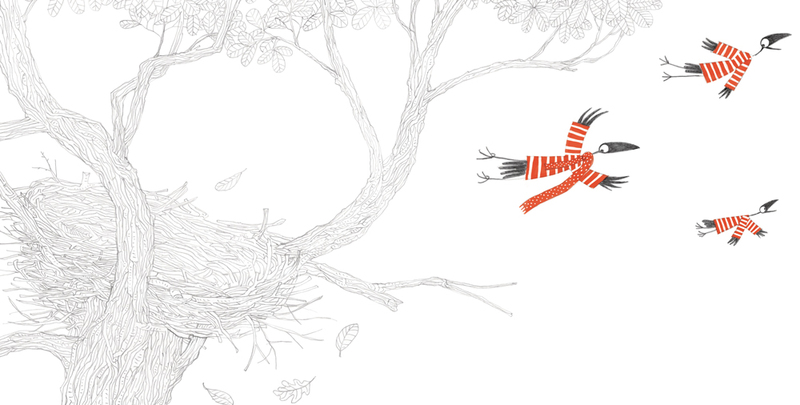 The titular birds are clad in baggy red-striped sweaters and scarves and engage in playful activities: tumbling through the air, larking around in a tree, filching bugs and fruit, scavenging peanuts, plums, ants and crackers, and finally taking flight from a predatory cat. 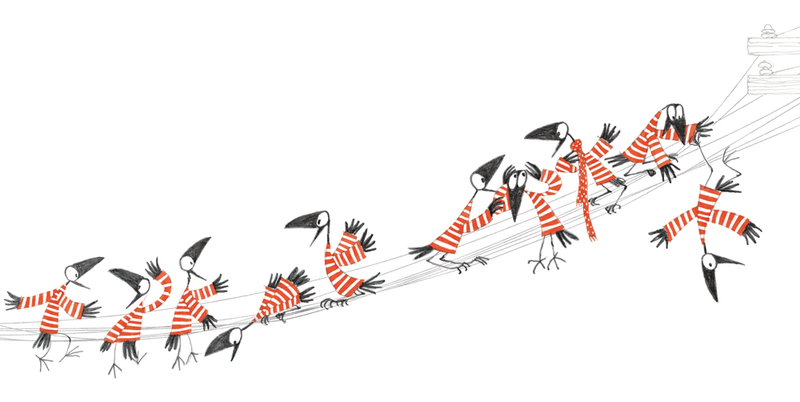 The illustrations capture the humorous character of this amusing bird; the cawing and crunching are almost audible as the crows descend en masse upon an inviting trash bin and rifle through its delectable contents. Appelt’s rhyming couplets are lively and onomatopoeic: “Nine little spicy ants, / nine round crackers. / Nine for the counting crows. / Nine, by smackers!” This is a real counting fest, as not only the crows, but the food they collect—berries, bugs and snacks—are fodder for the counting game and for improving reading skills at the same time. Dunlavey’s two-color illustrations in marker, pencil and watercolor have a refreshingly casual feel. The unusual typeface is well-chosen for this zany production, and it is sized and positioned with care in perfect relation to the illustrations. 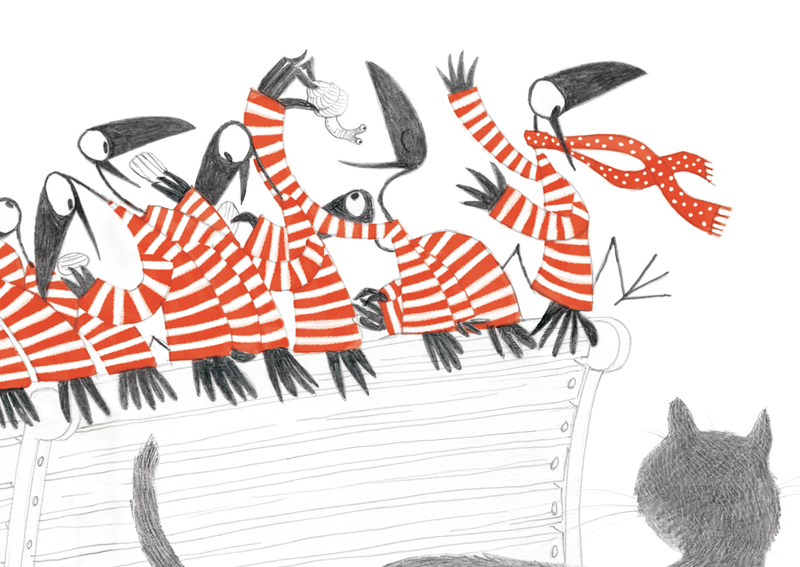 The book is attractively produced, with several different textured laminations on the cover, including cool fuzzy stripes for the crows’ sweaters.